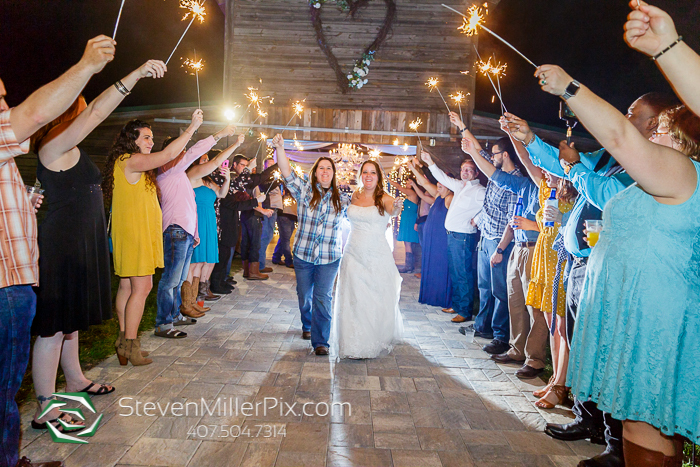 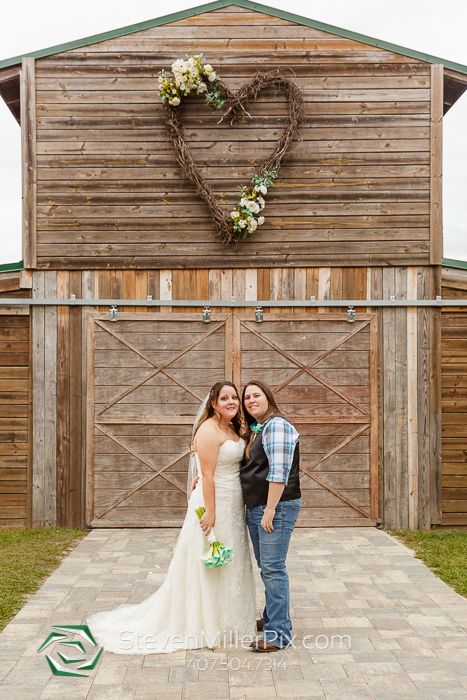 Wedding Photographers Michael and Tammy recently captured the beautiful wedding day of Lexi and Brittany at The Enchanting Barn! 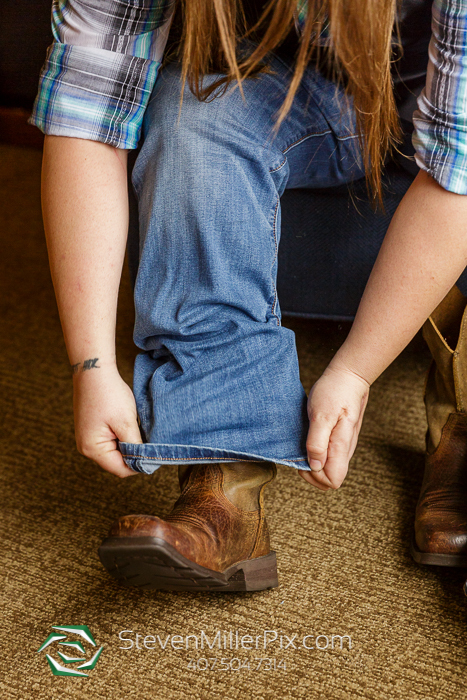 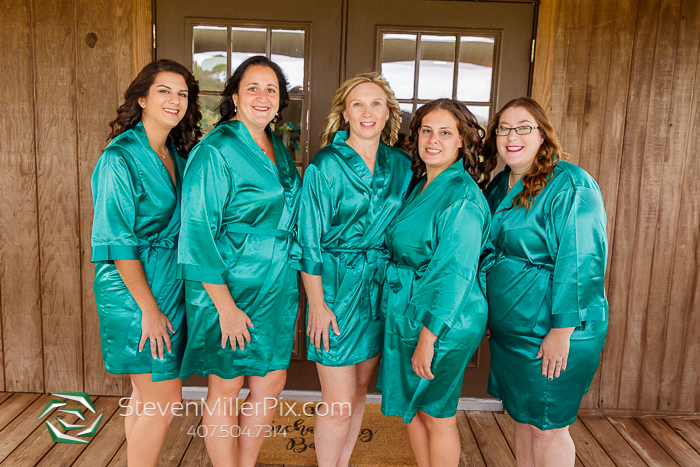 We began the day with Brittany’s bridal preparations at the Comfort Inn & Suites and then headed to The Enchanting Barn for Lexi’s preparations! 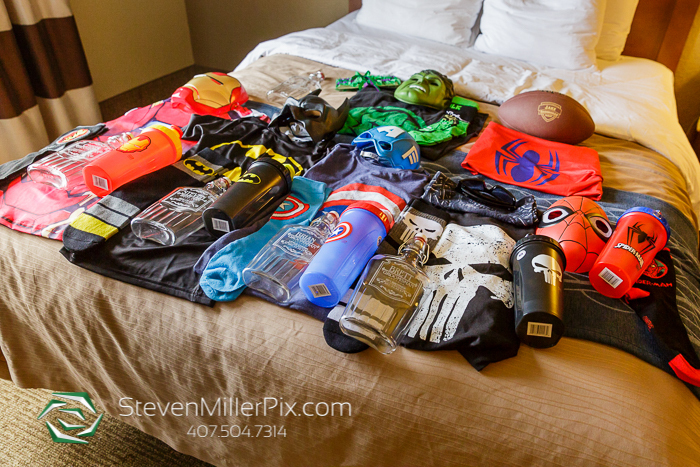 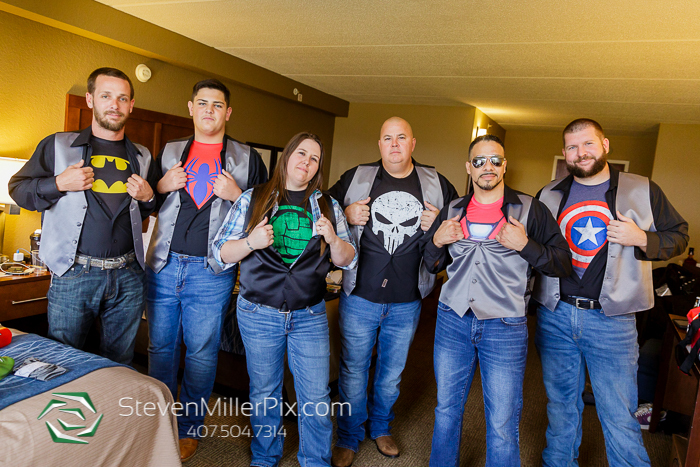 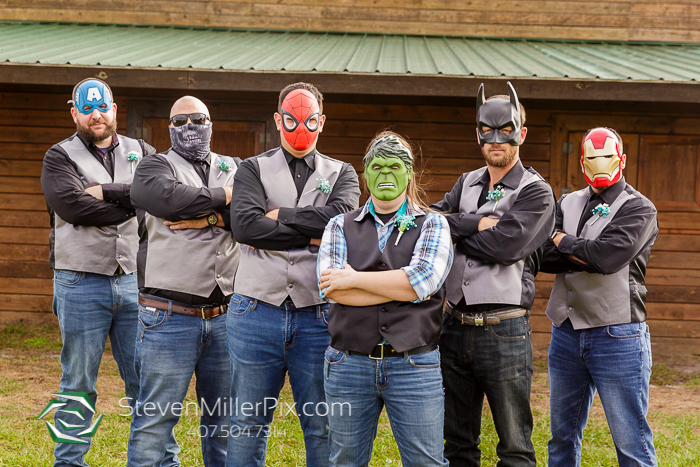 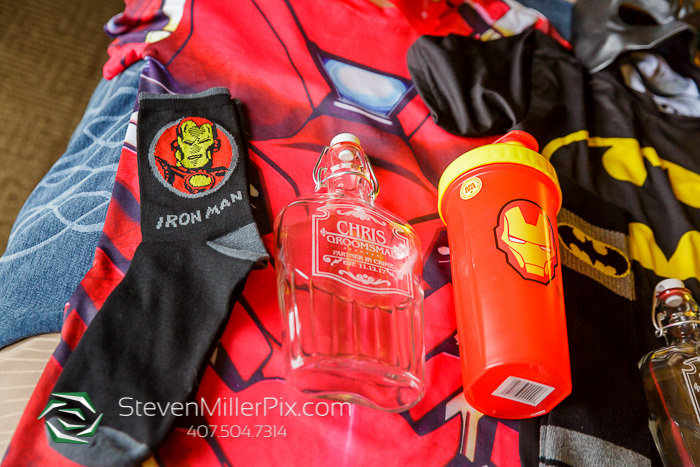 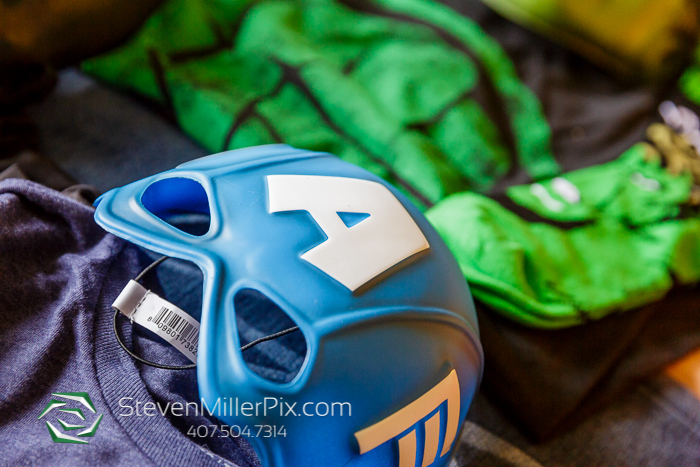 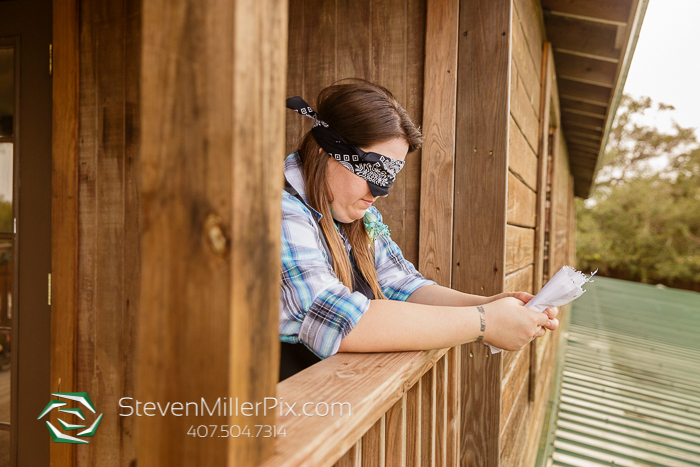 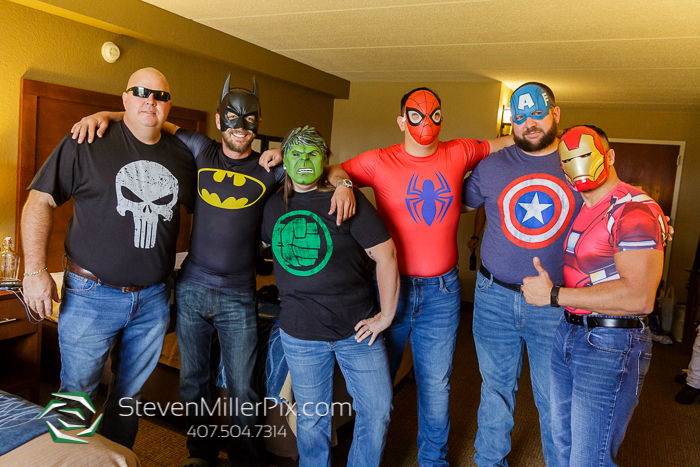 We loved capturing the personalities both parties had, including all the superhero shirts on Brittany’s side and the country details Lexi incorporated! 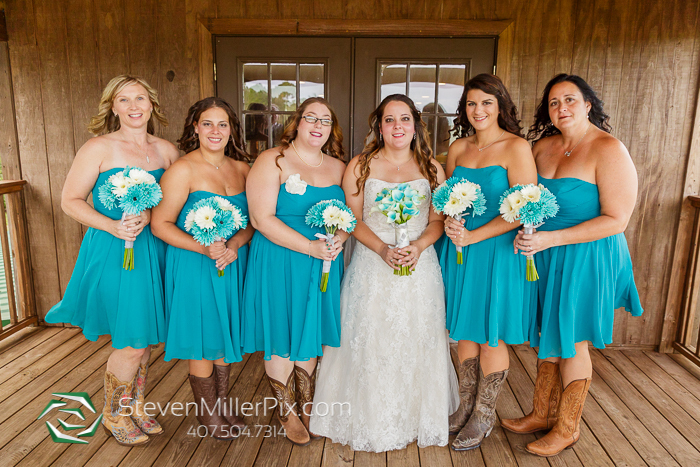 Sanford Flower Shop did an amazing job with the girls bouquets and the guys boutineers! 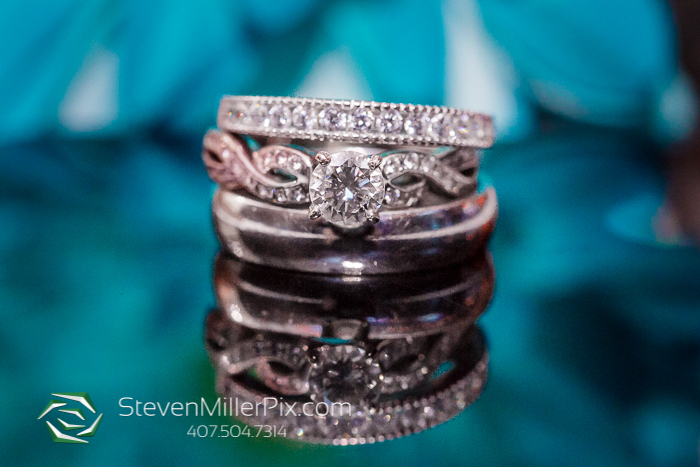 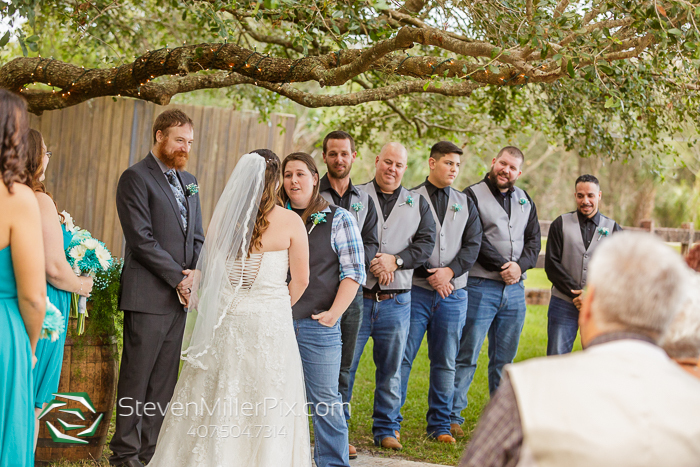 Once they were both ready, they wanted to do a “first touch” which allows each other to hold hands and be with each other before the ceremony, but not see one another! 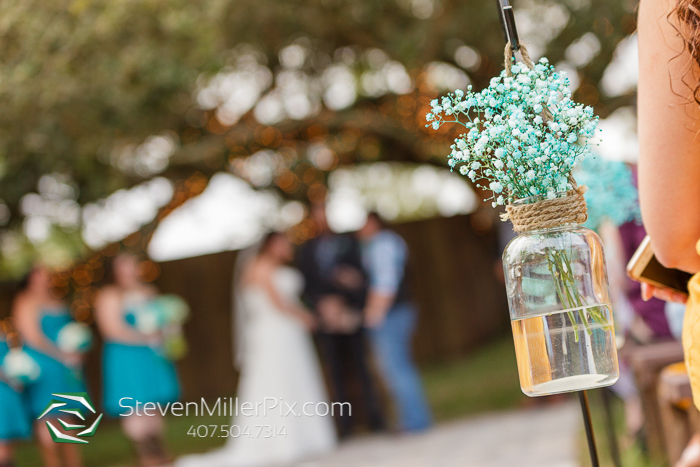 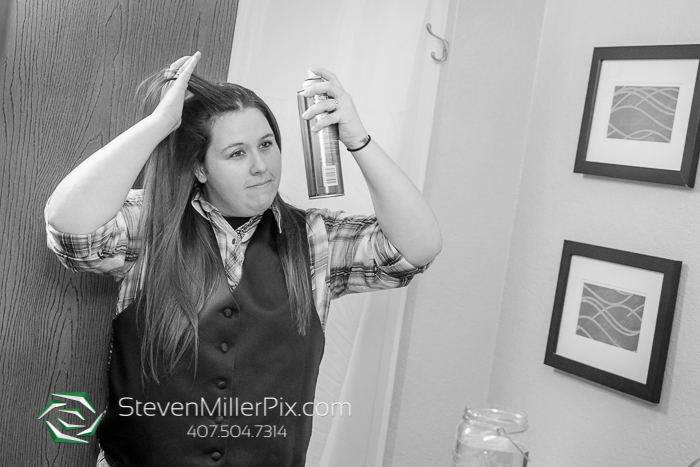 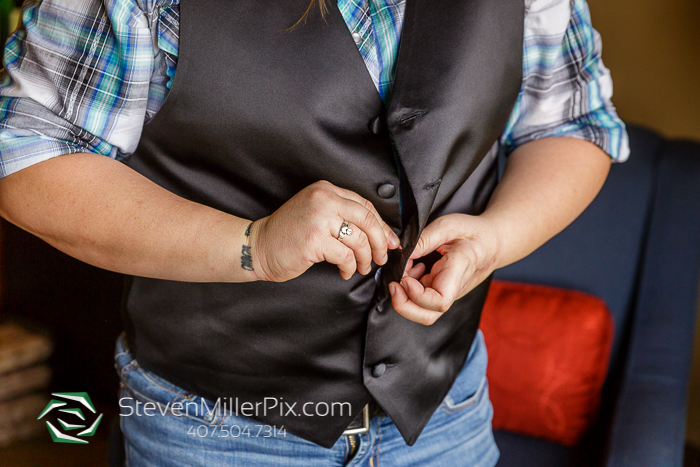 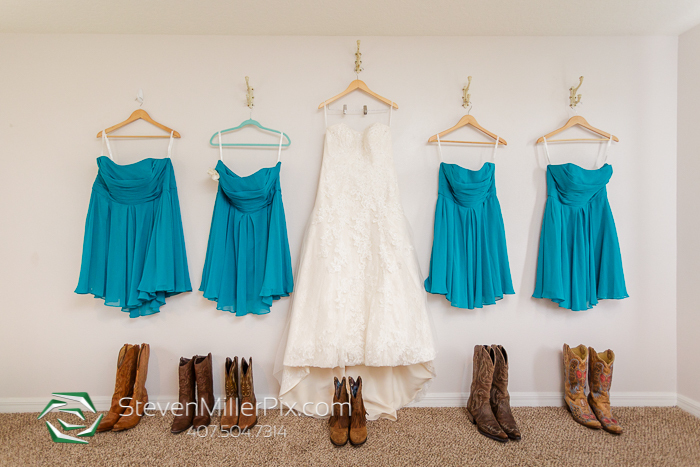 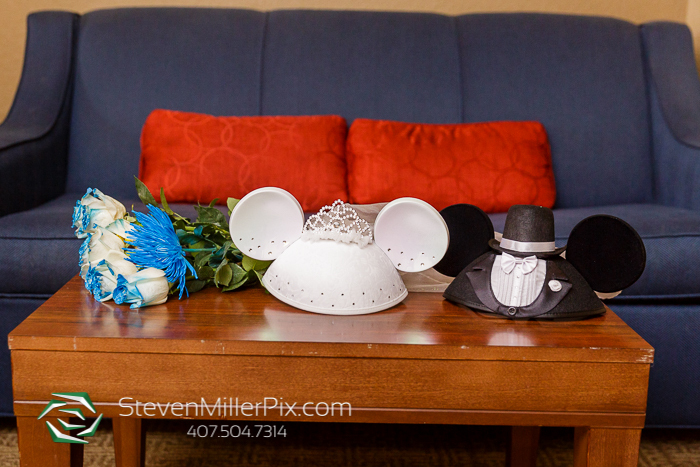 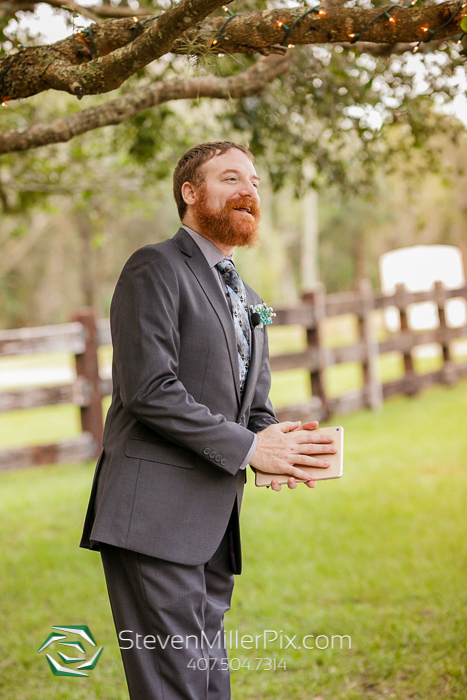 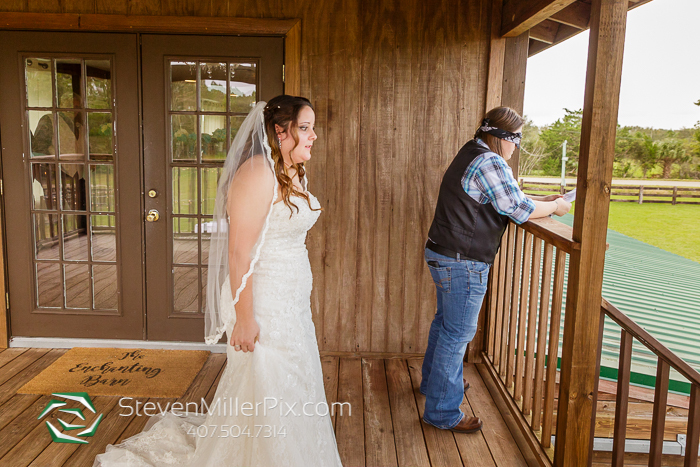 Such a cool concept if you do not want to see each other before the ceremony, but still want some cool photos! 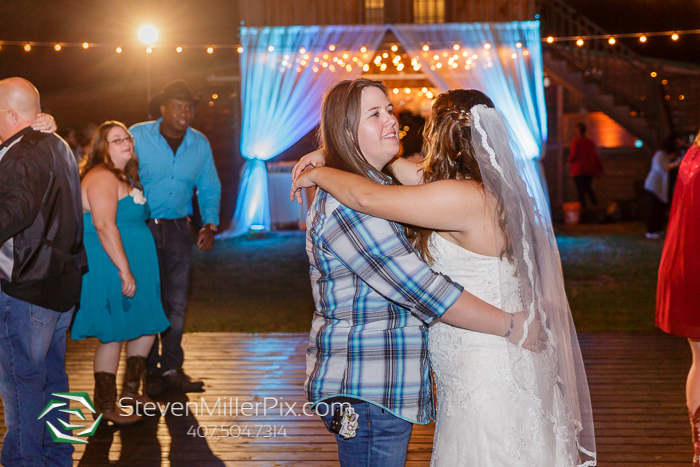 Lexi could not wait to see Brittany! 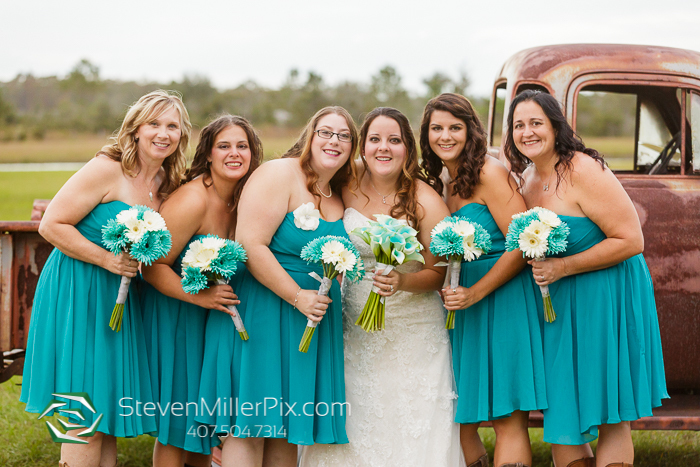 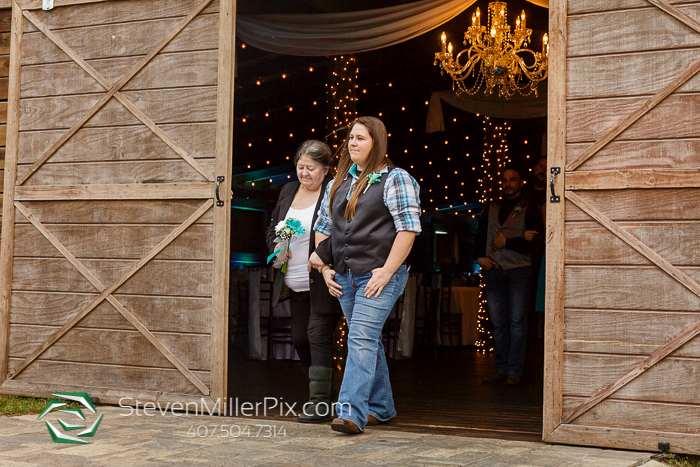 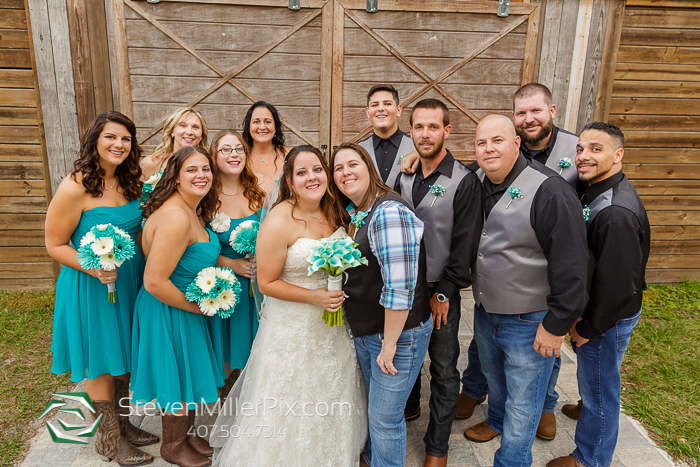 After the first touch, we captured each bridal party separate around the barn, but made sure to not be seen by the guests! 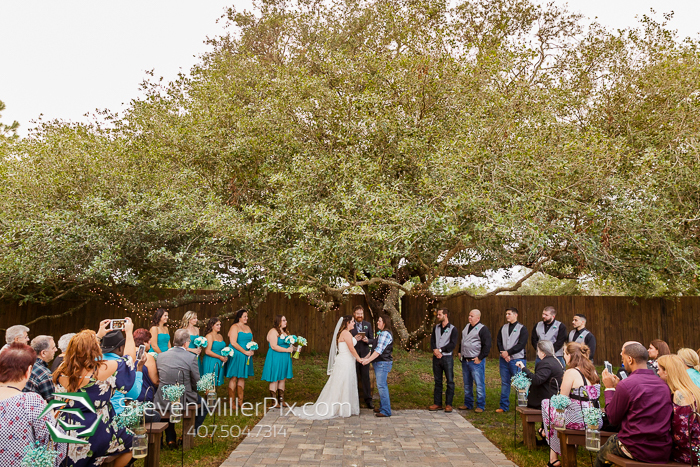 We captured most of the bridal party pictures before the ceremony and even started the ceremony early to maximize the lighting due to the quickly setting sun! 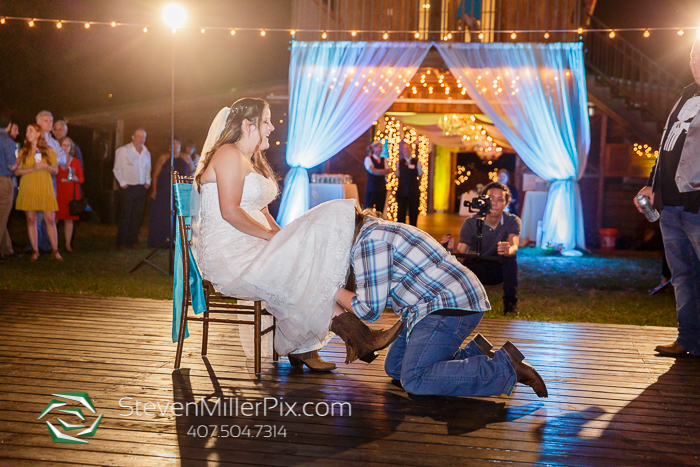 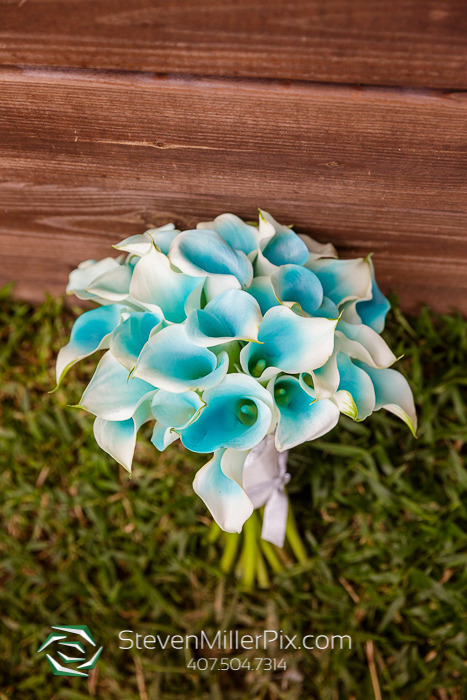 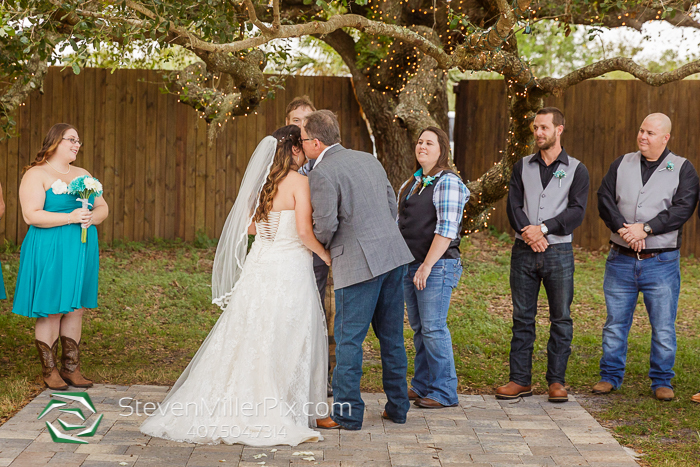 Their outdoor wedding ceremony was the absolute sweetest! 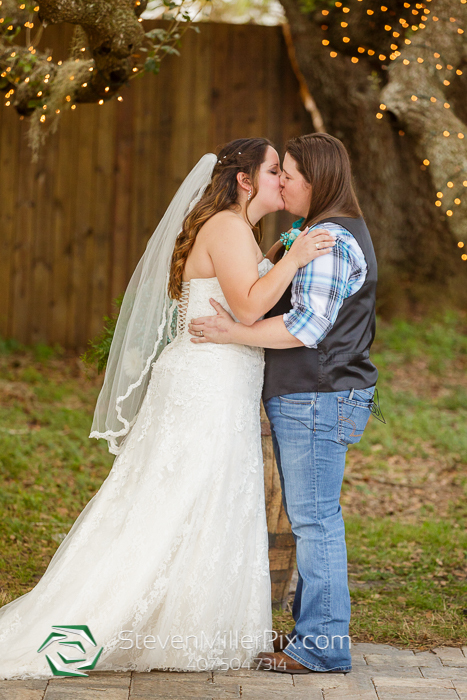 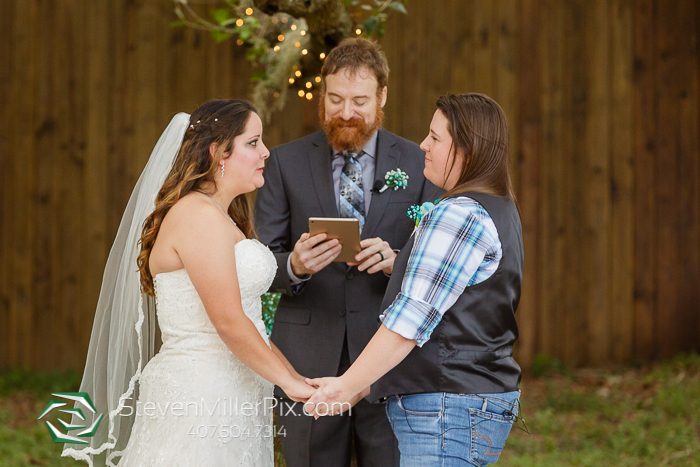 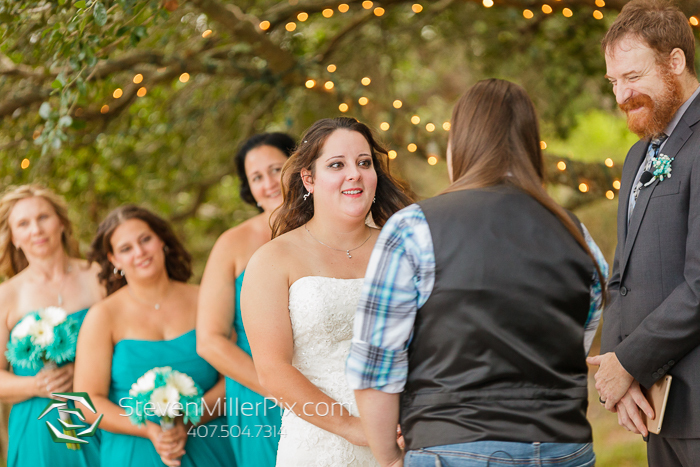 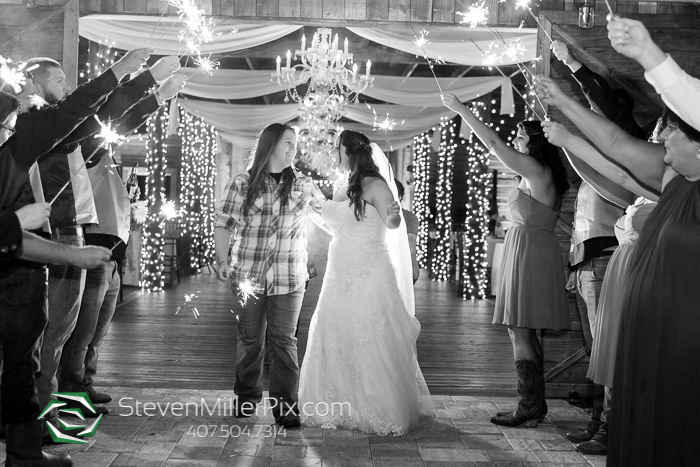 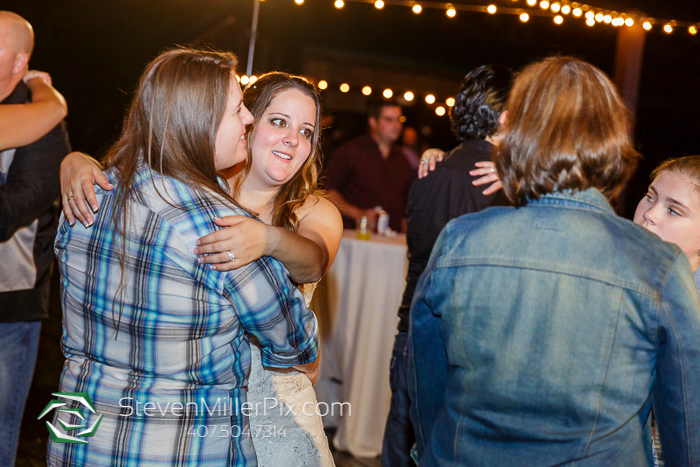 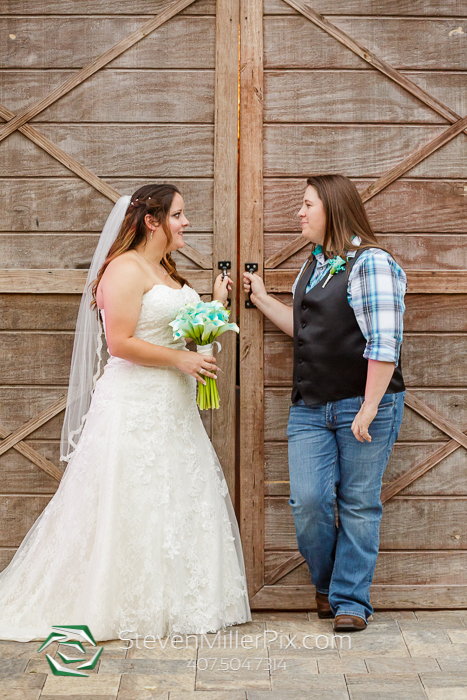 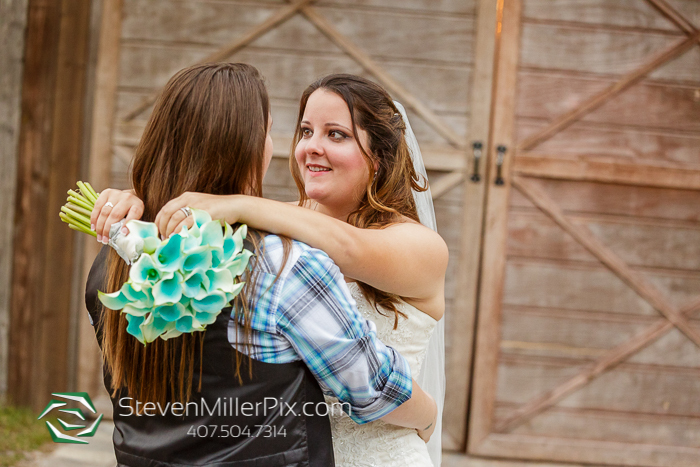 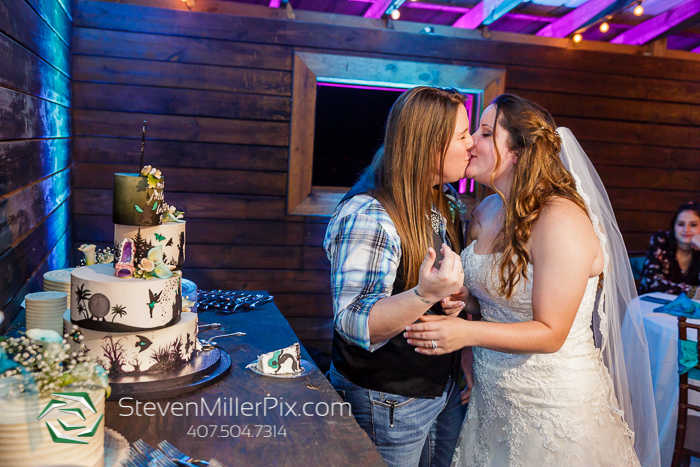 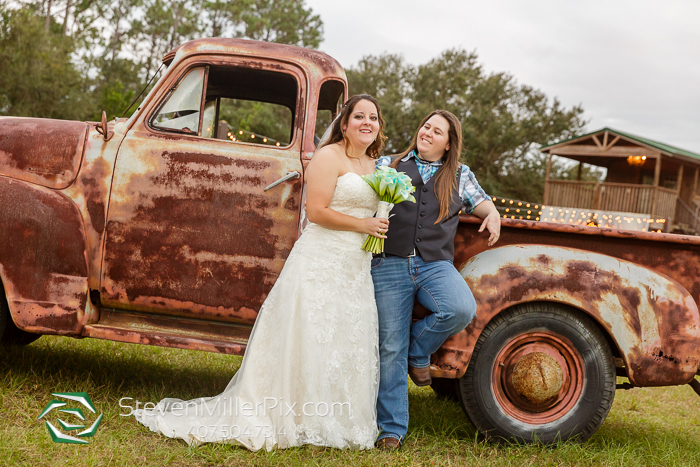 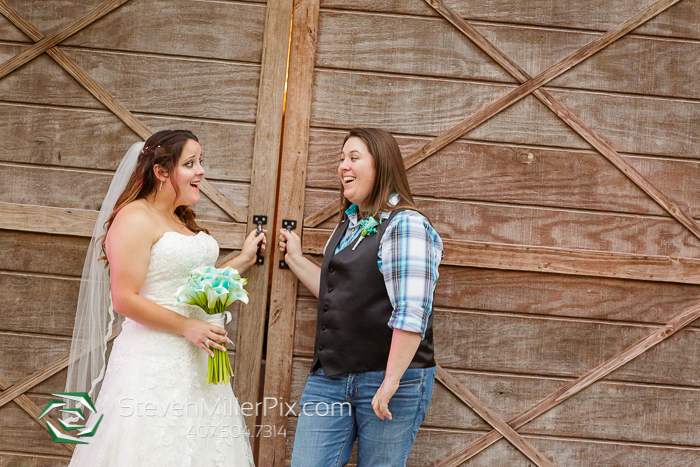 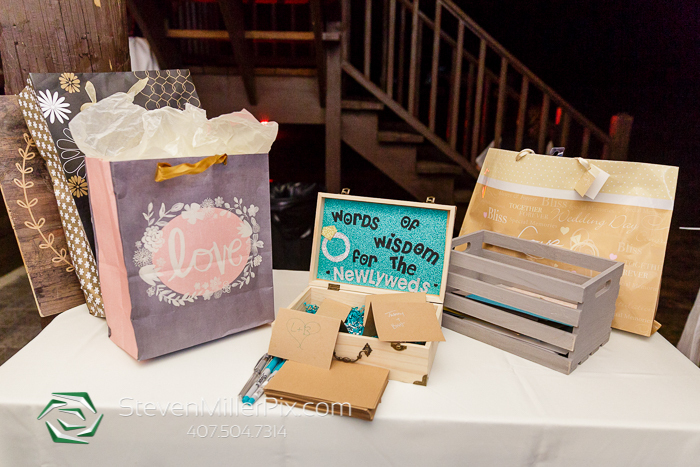 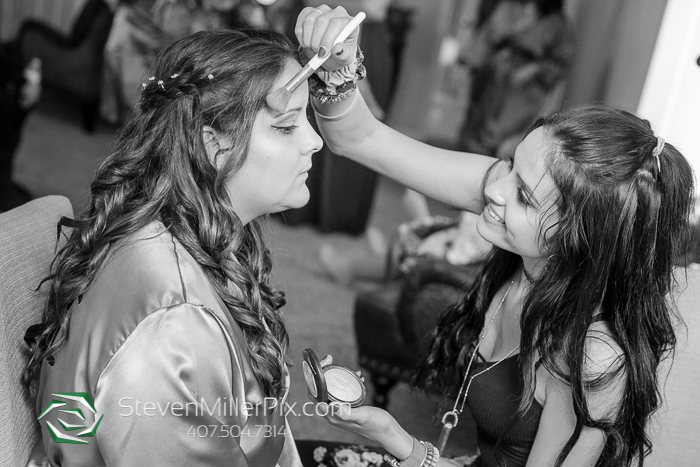 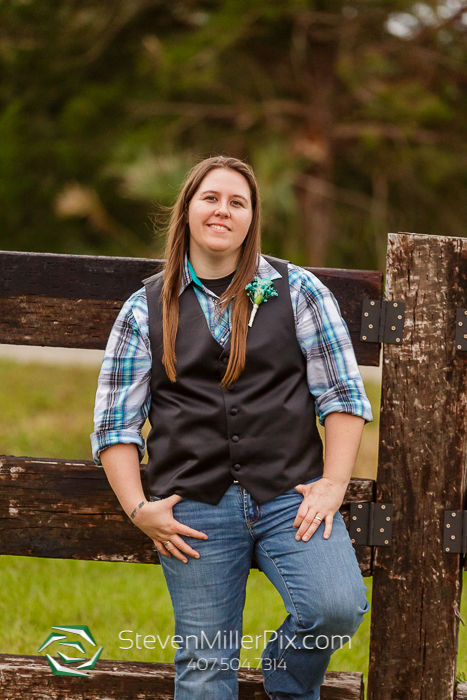 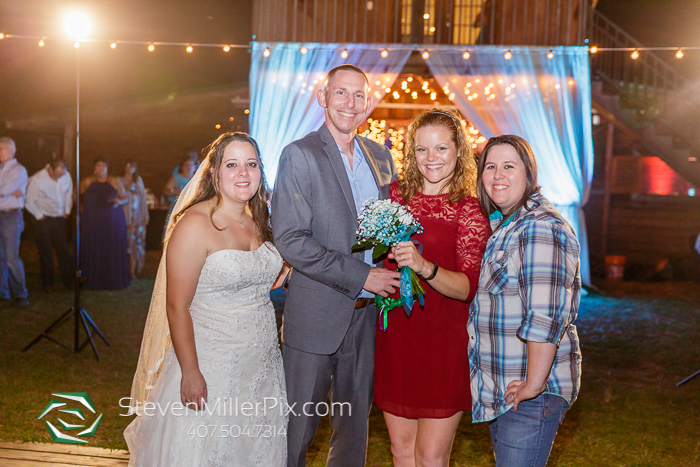 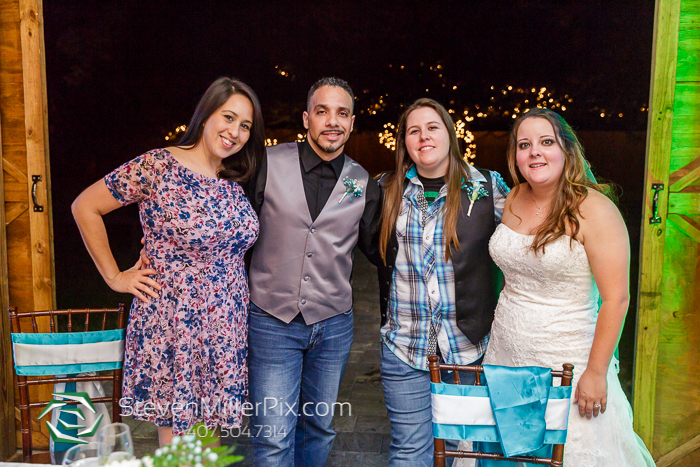 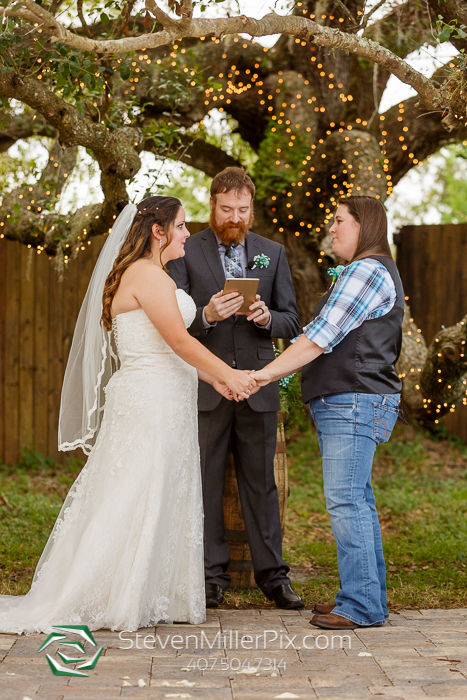 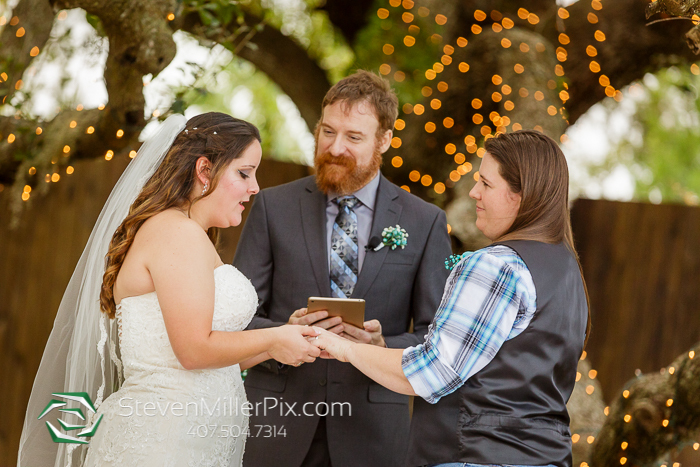 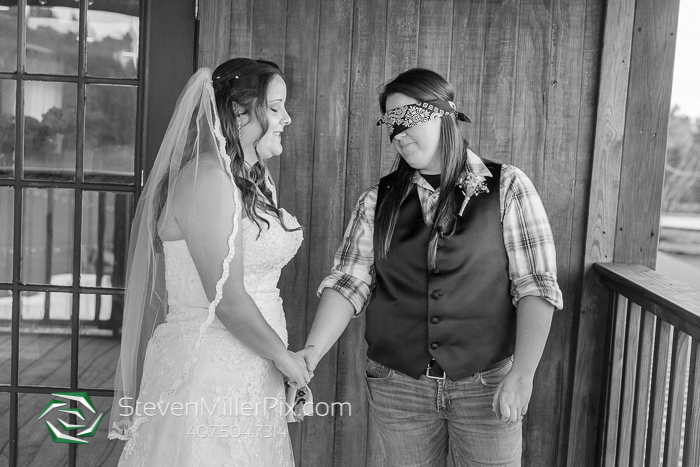 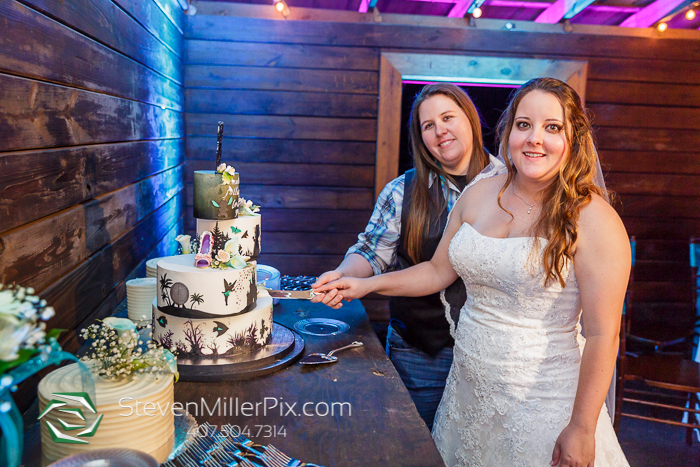 Lexi and Brittany exchanged their vows with officiant and longtime friend MJ, of Junction 88! 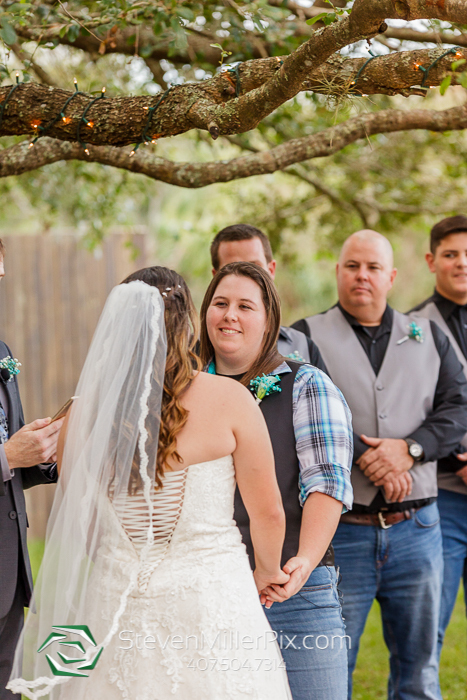 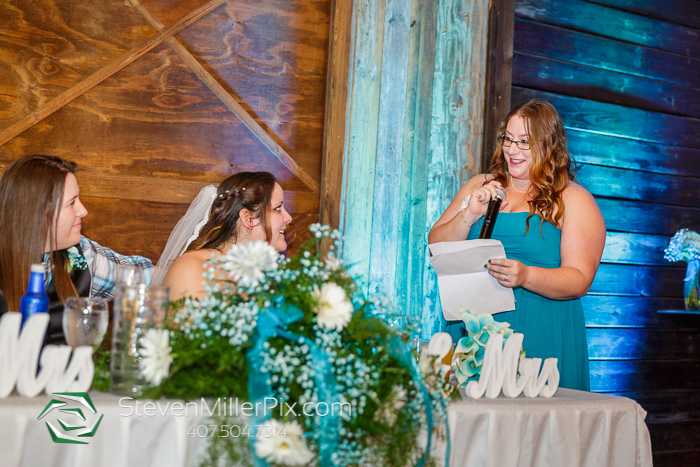 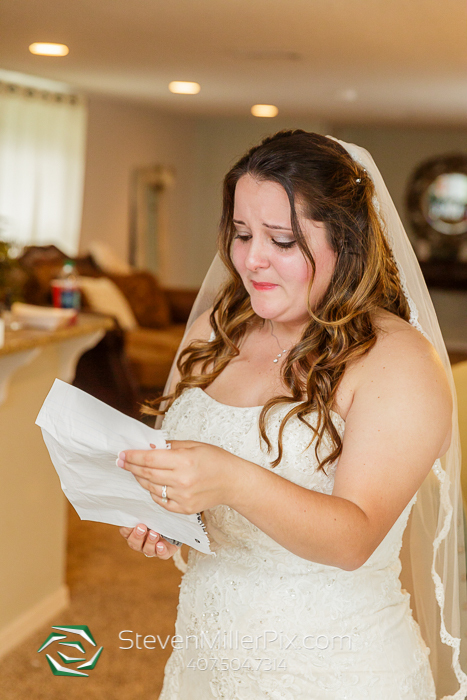 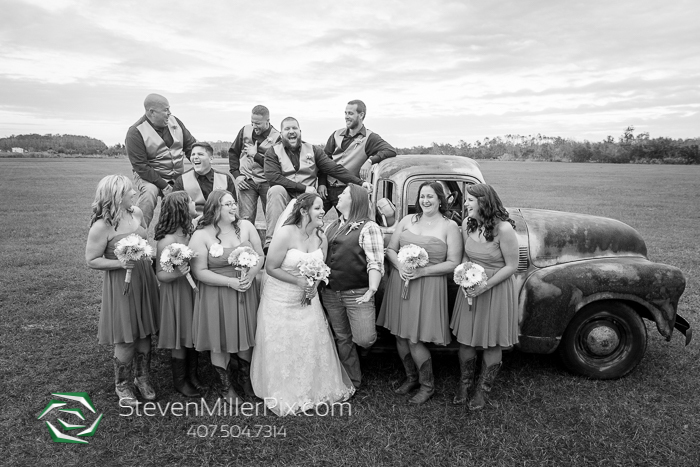 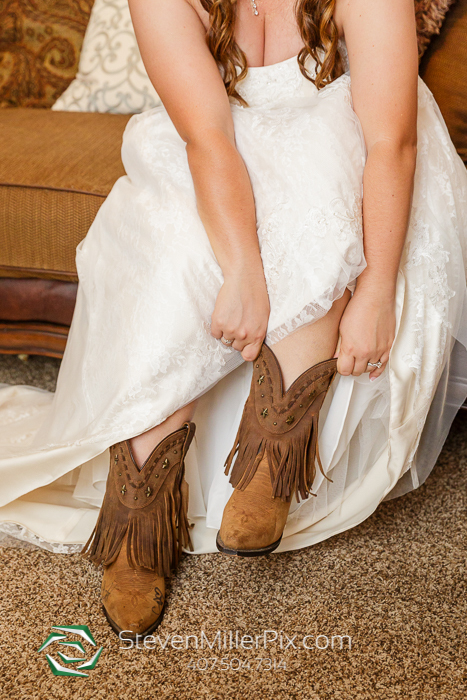 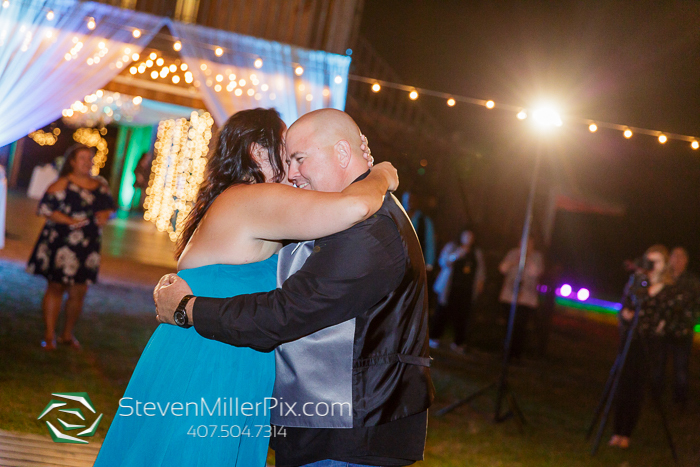 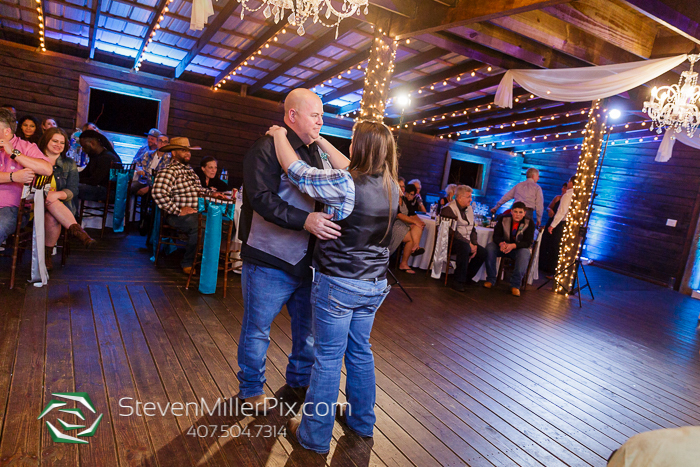 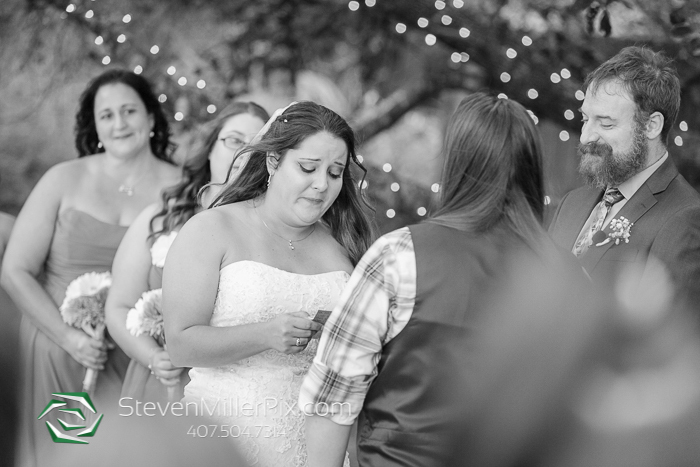 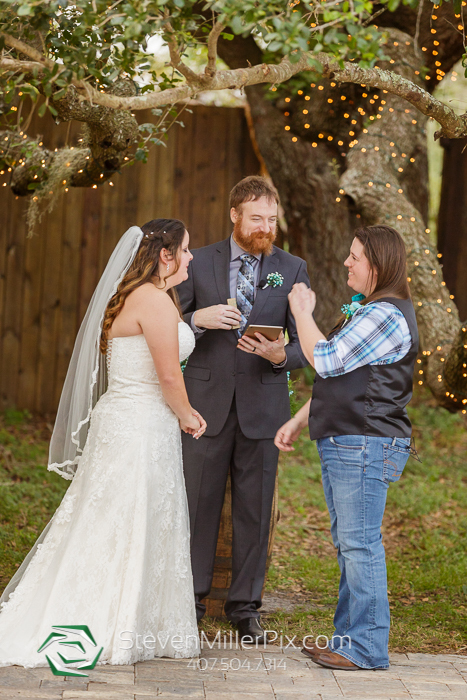 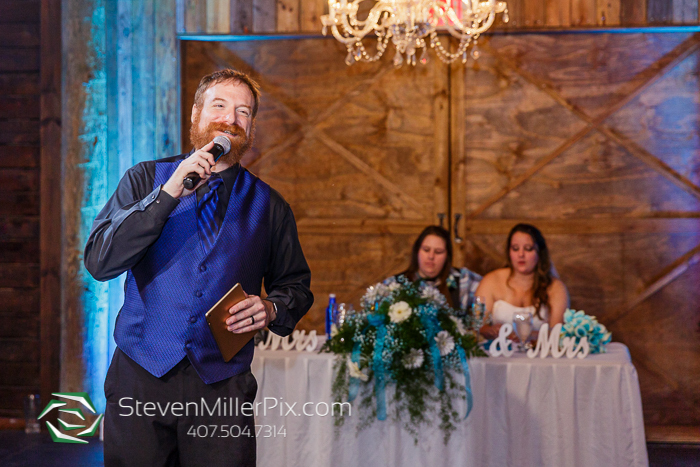 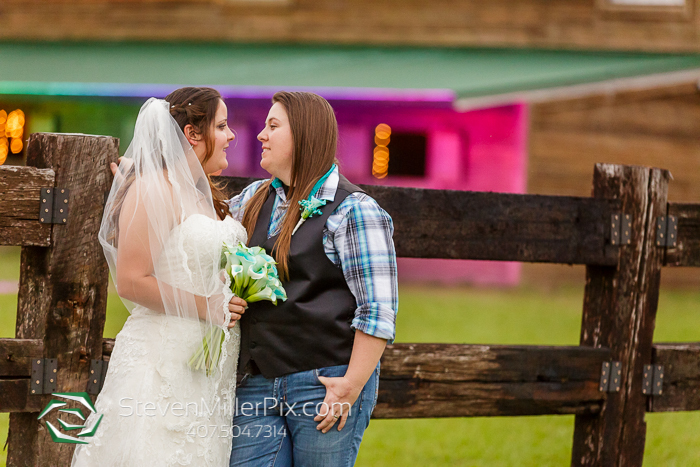 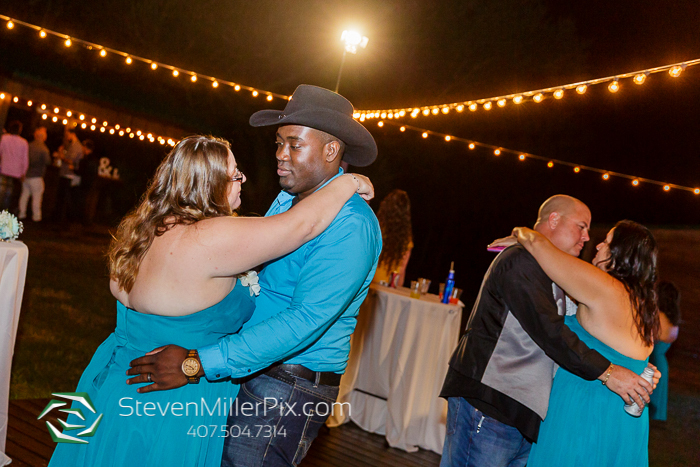 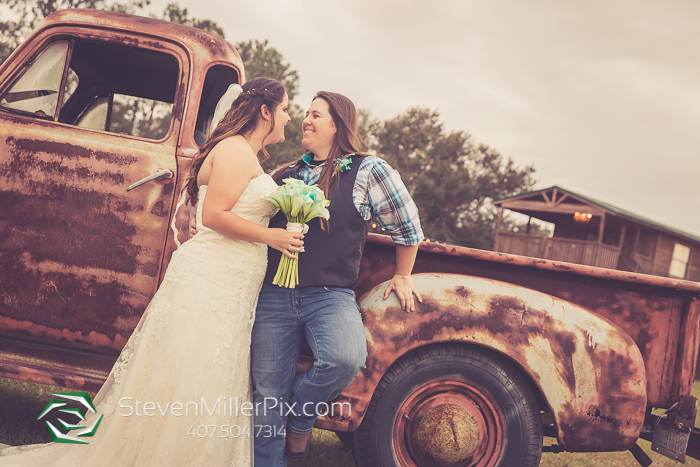 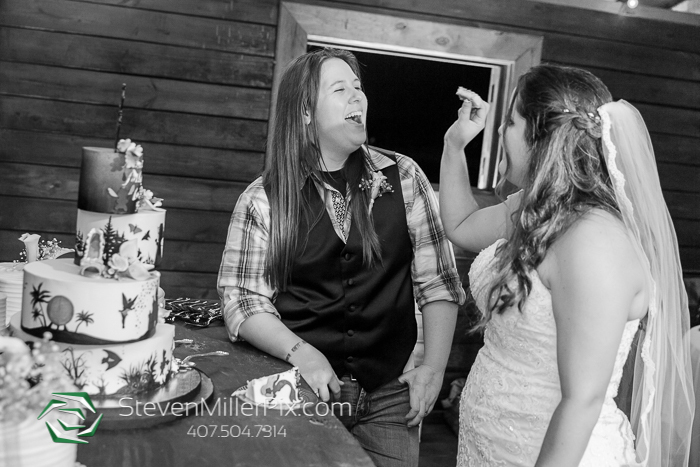 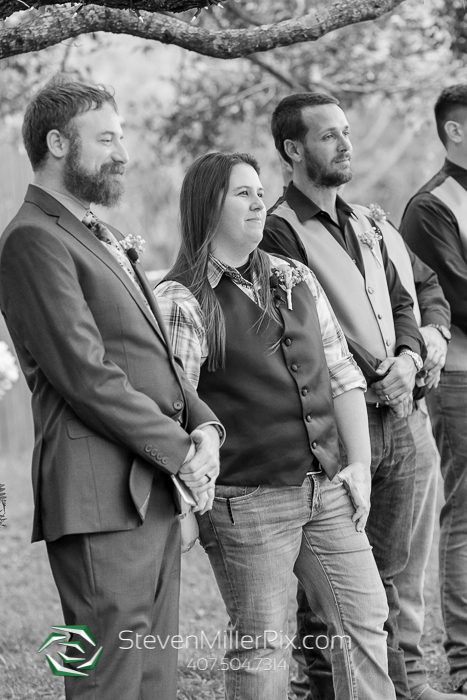 They read each others vows and we loved the country lyrics Brittany incorporated in her vows, it definitely added a lot of personality and laughs to their already touching ceremony! 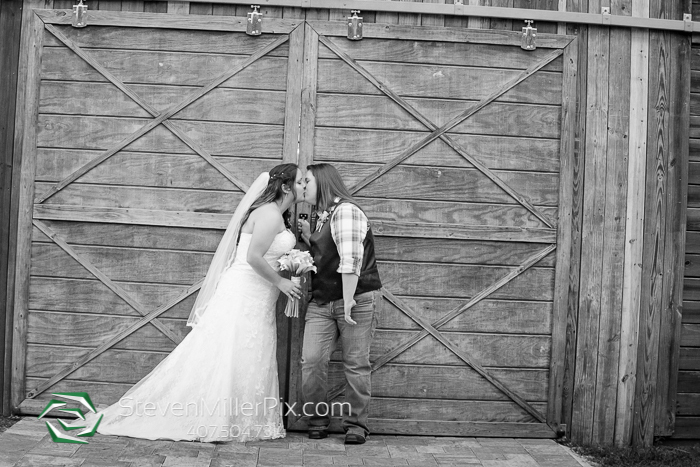 Of course they sealed the deal with the all-important kiss!! 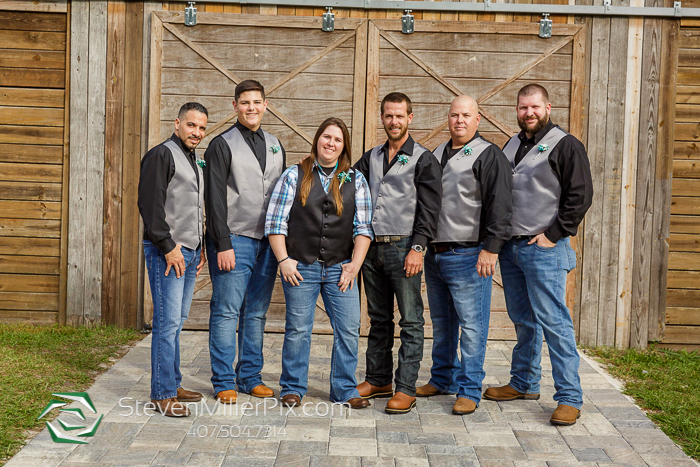 We followed their ceremony with portraits of the bridal party together, family photos and tons of great portraits of the newly married couple around the barn! 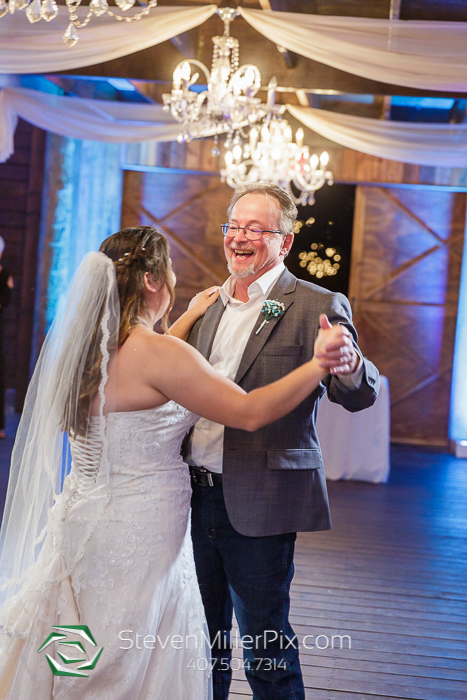 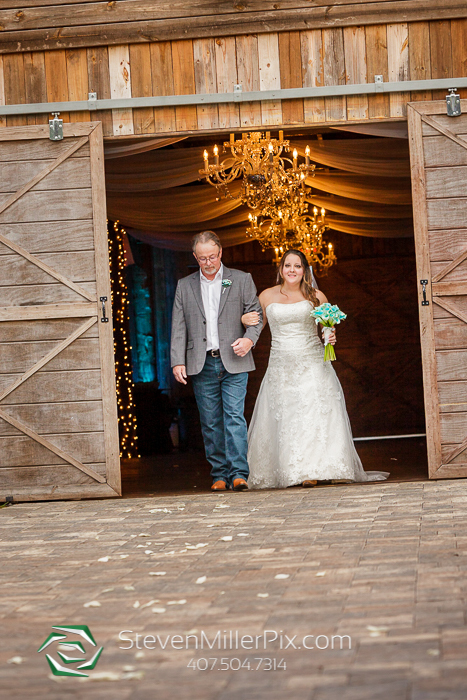 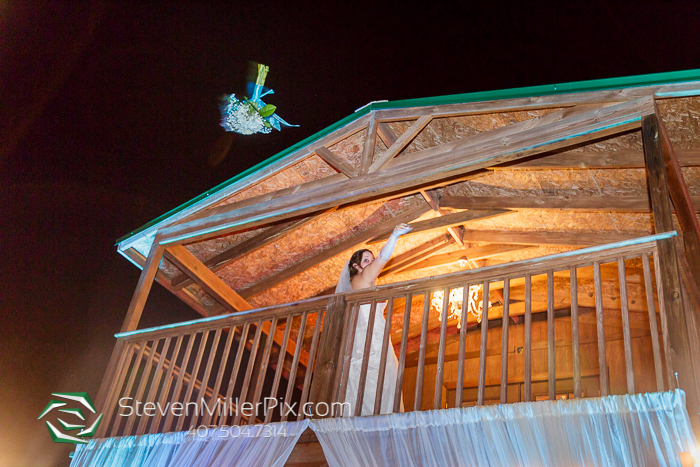 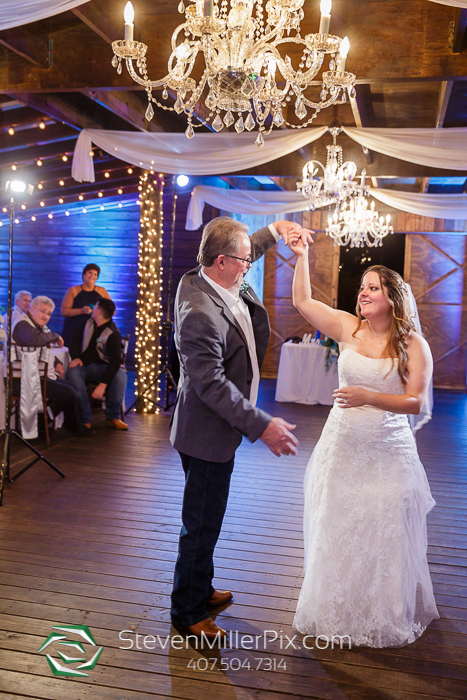 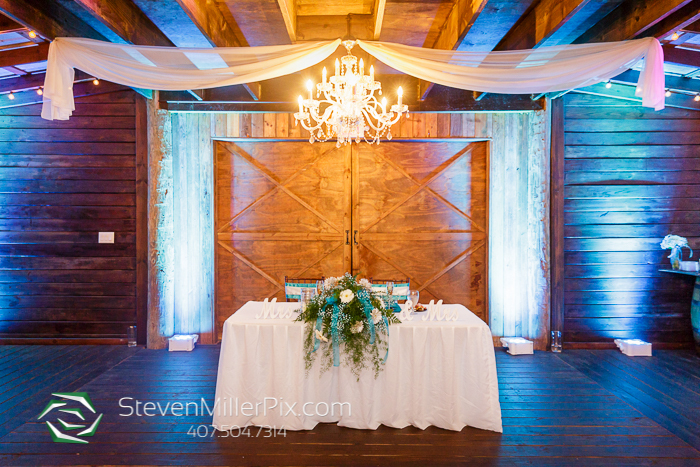 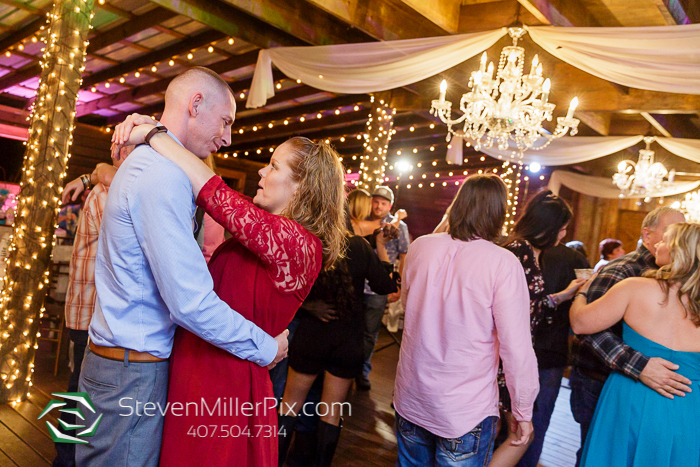 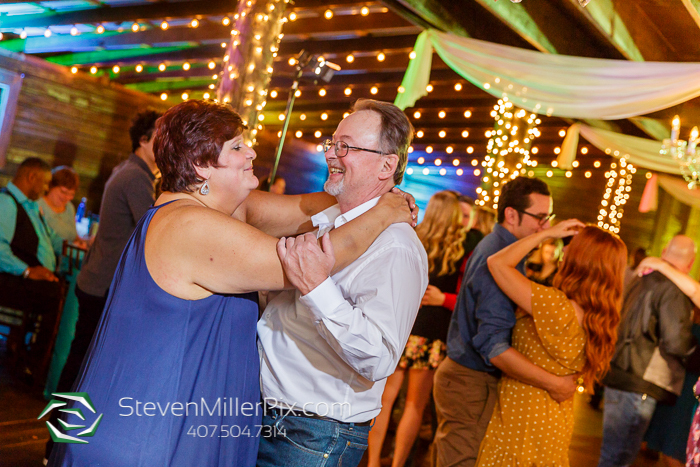 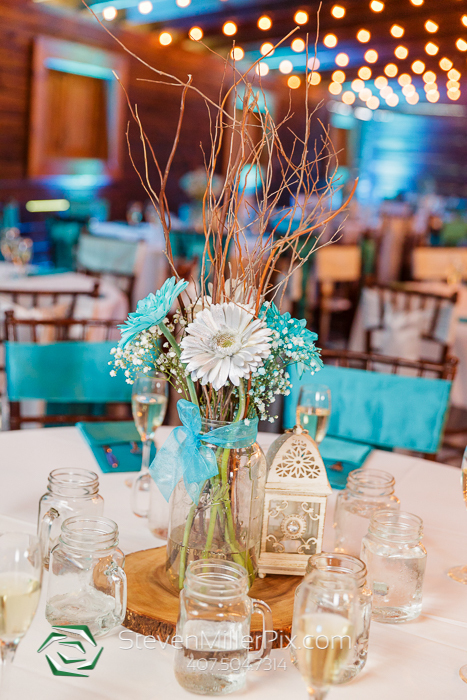 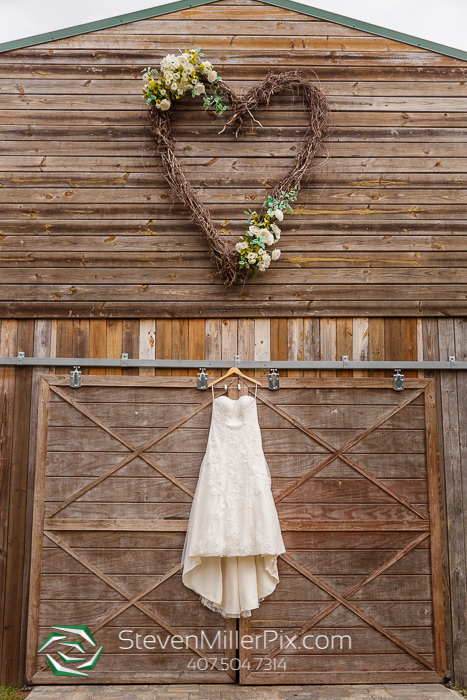 Their indoor wedding reception also took place at The Enchanting Barn, and it was definitely one to remember! 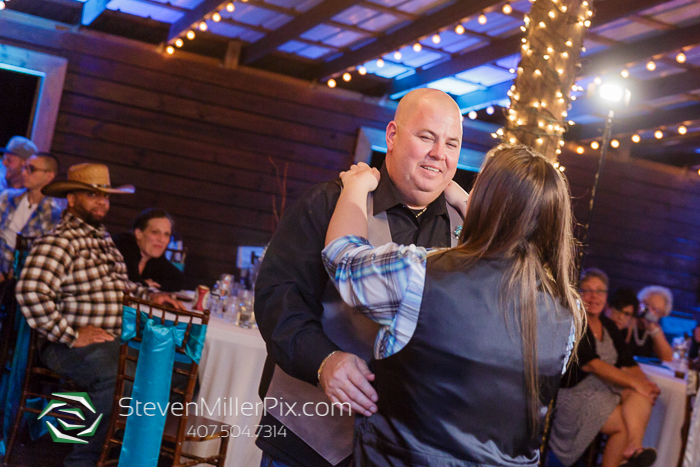 DJ MJ of Junction 88, kept their dance floor packed throughout the night! 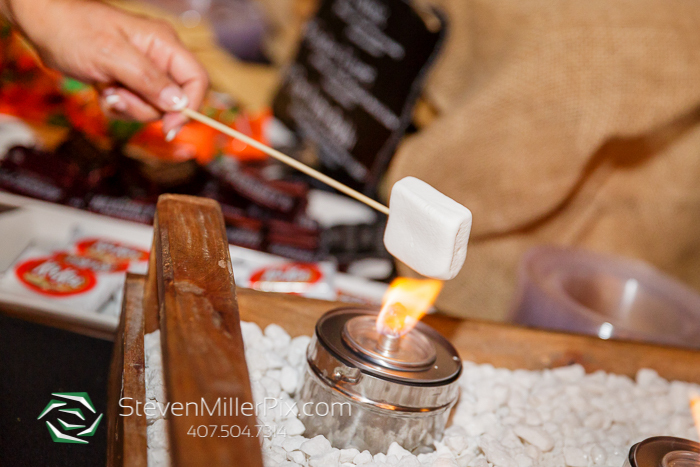 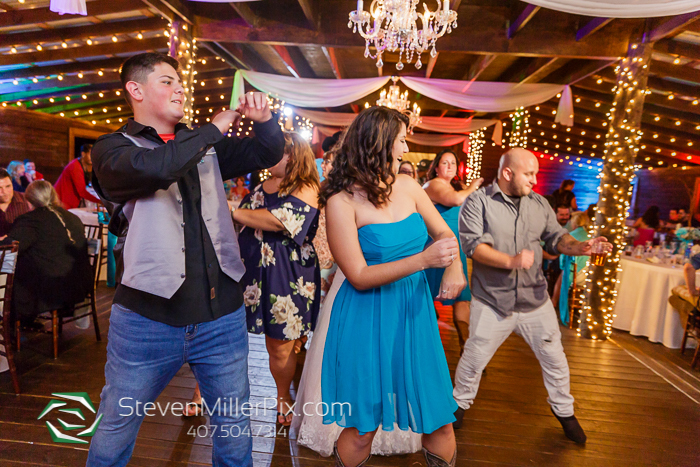 They even had a dance floor outside where a lot of party goers could dance under the stars, enjoy the nice weather and roast marshmallows at the s’mores station! 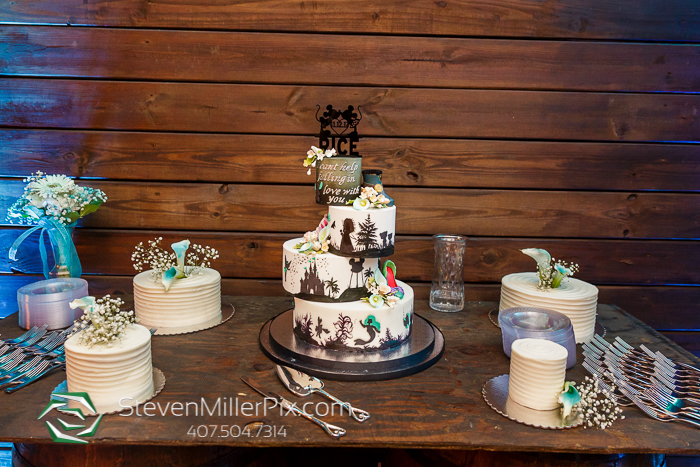 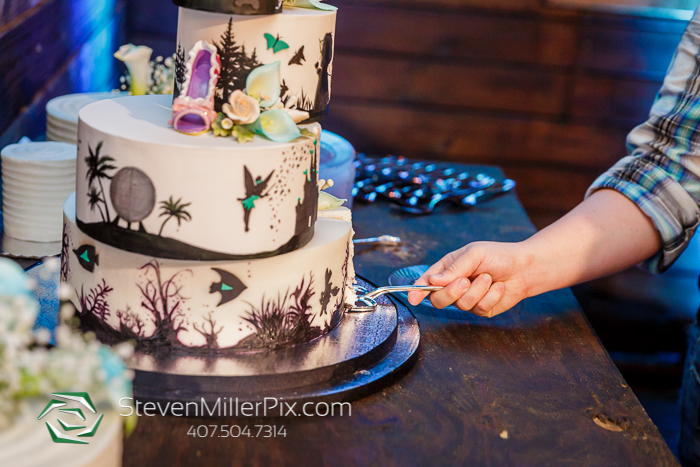 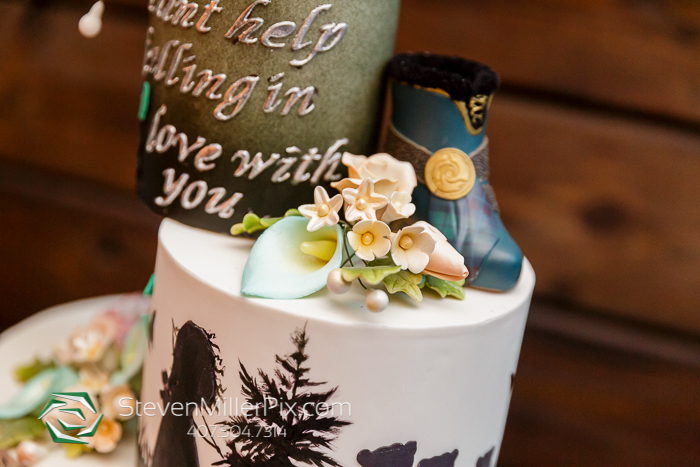 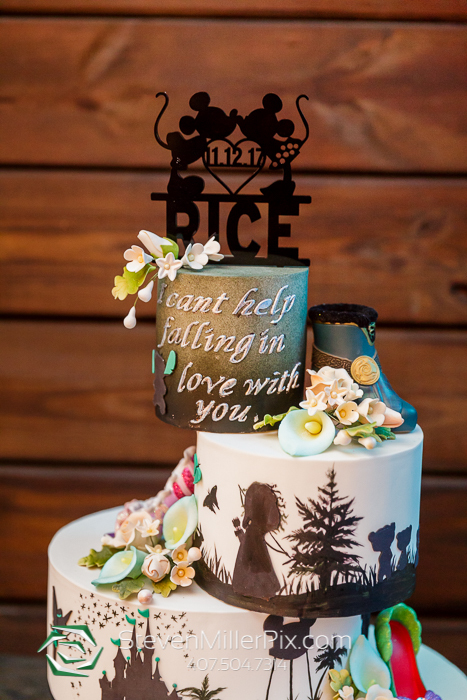 Sprinkles Custom Cakes created their stunning wedding cake and outfitted it with a bunch of Disney character silhouettes which definitely made this a cake to remember! 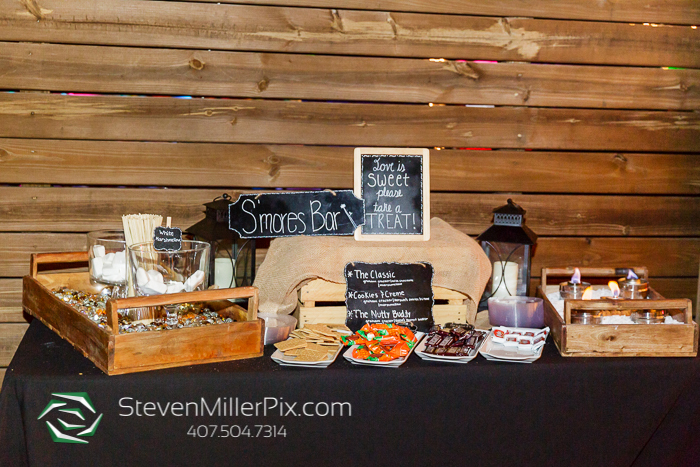 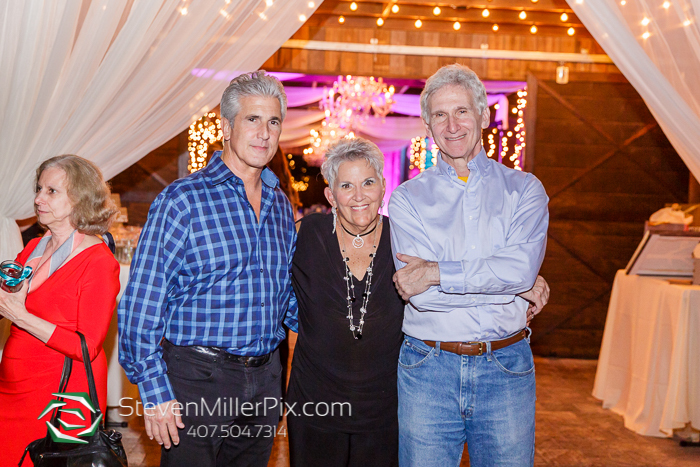 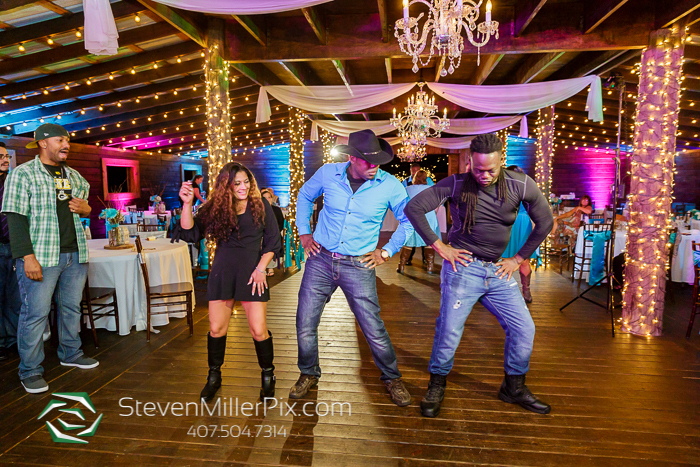 Serve All Catering provided a great buffet meal that kept everyone energized all night to party! 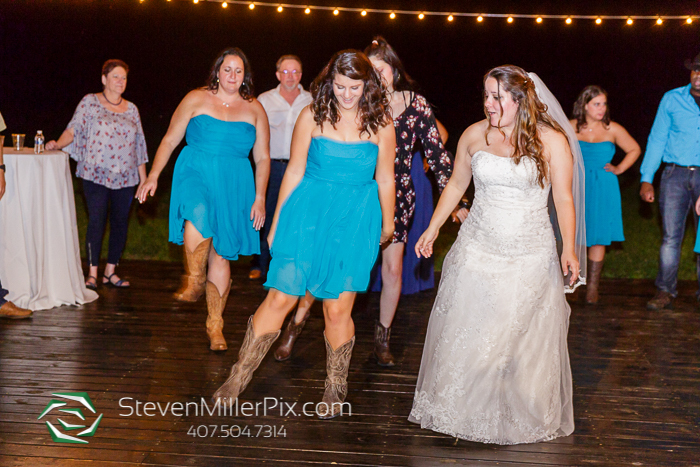 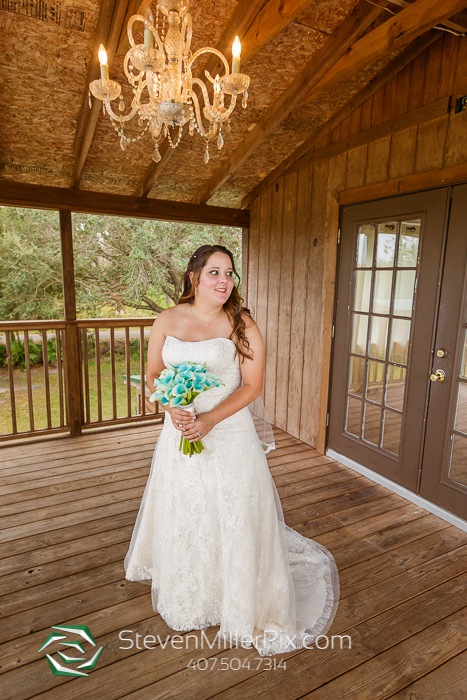 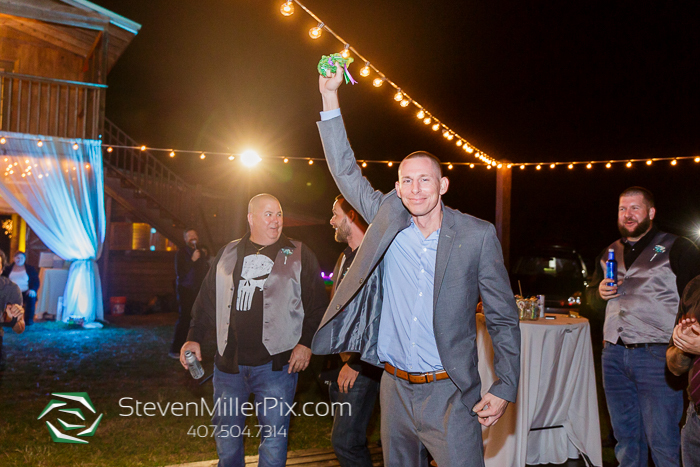 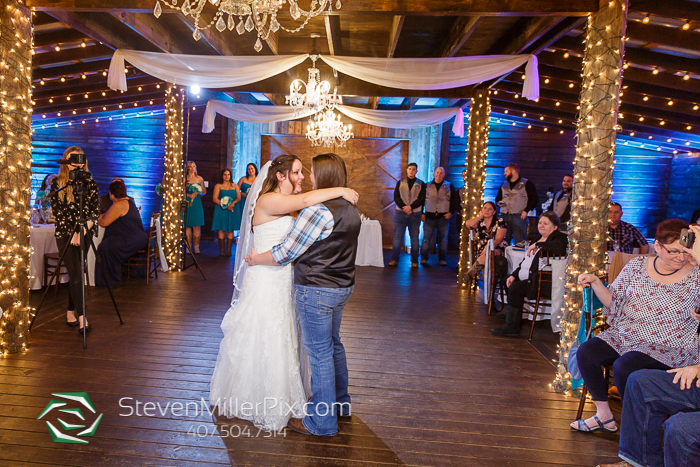 Lexi and Brittany celebrated their reception with a first dance, parent dances, a cake cutting, and a bouquet toss off the balcony of the barn! 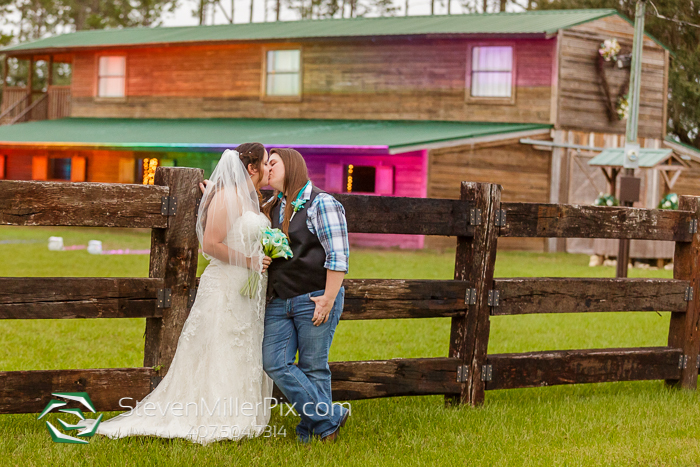 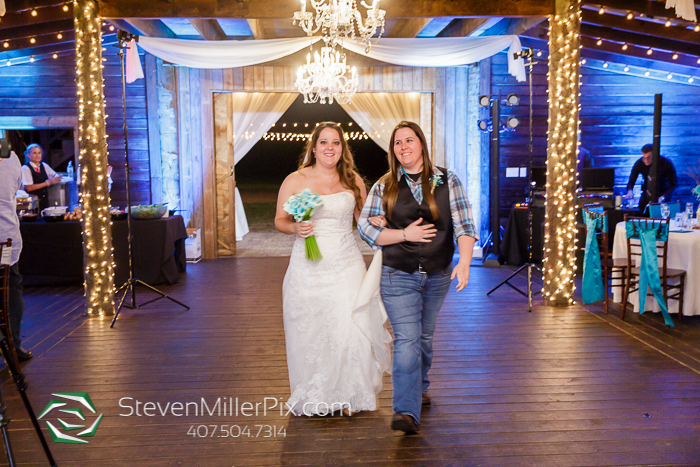 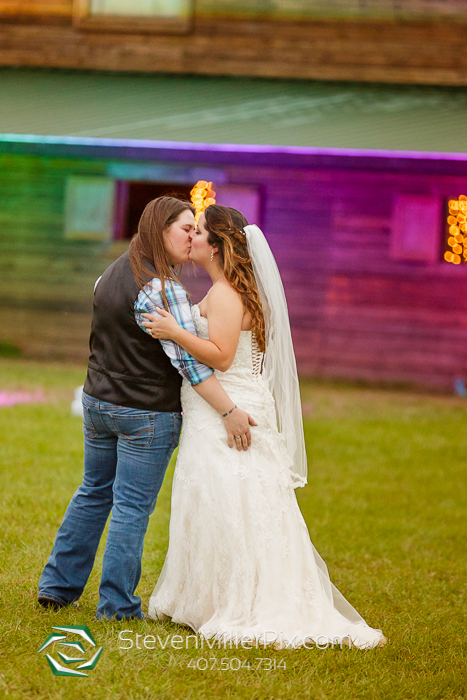 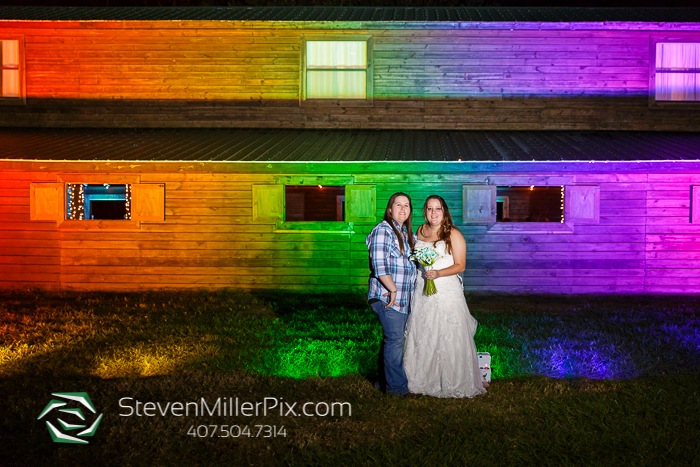 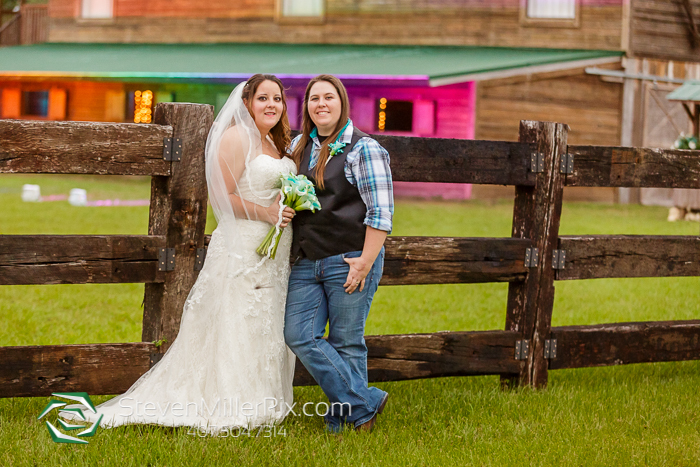 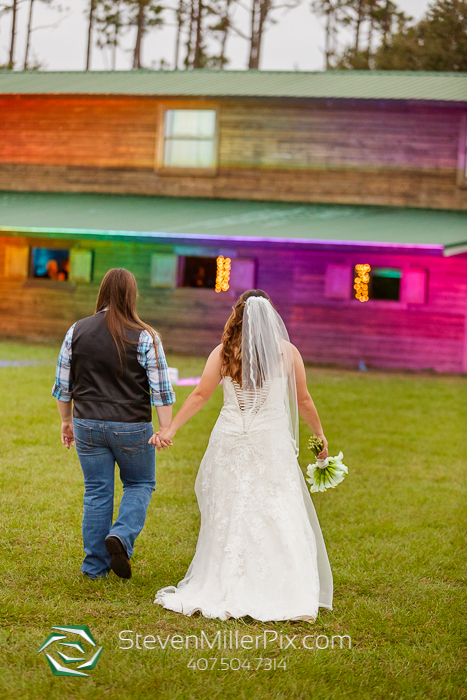 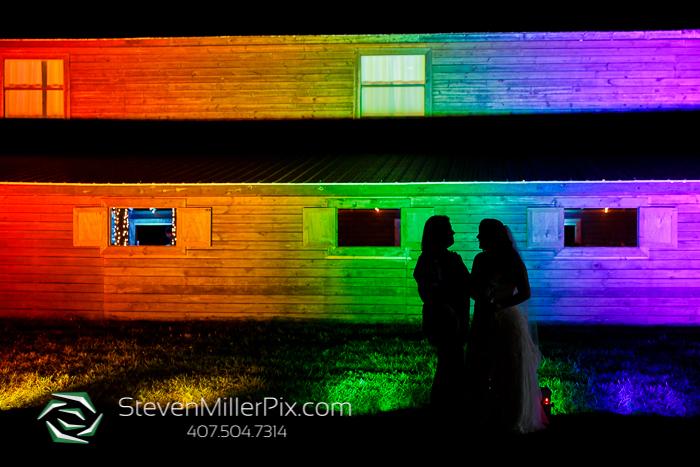 We also took a moment to sneak Lexi and Brittany outside during their reception for a few extra portraits alongside the rainbow lit barn! 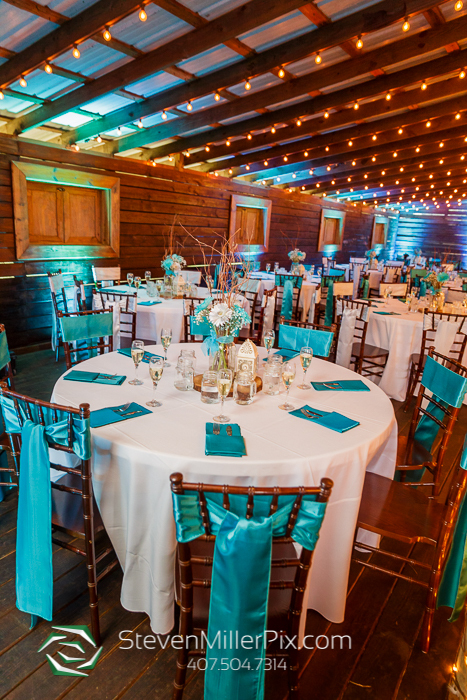 Special thanks to MR Events, who helped make the barn look very colorful with the chair sashes and napkins! 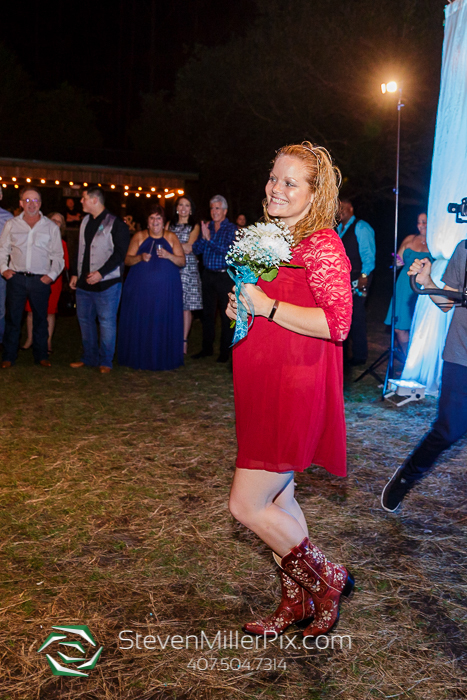 We would also like to shout out to Cinematology Unlimited for being such a great videographer to work with throughout the whole day! 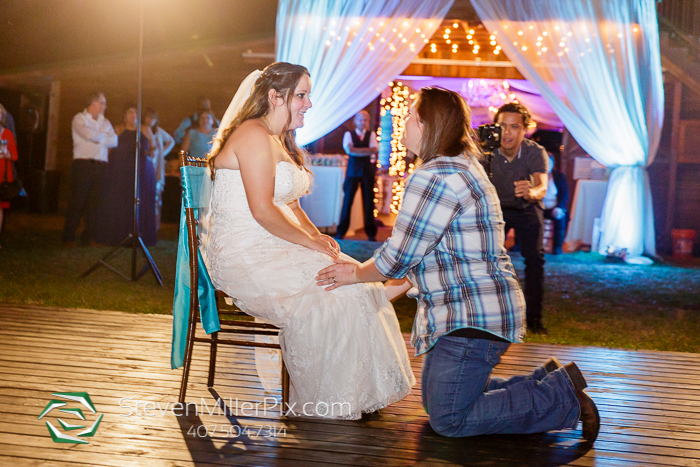 We cannot wait to see the video! 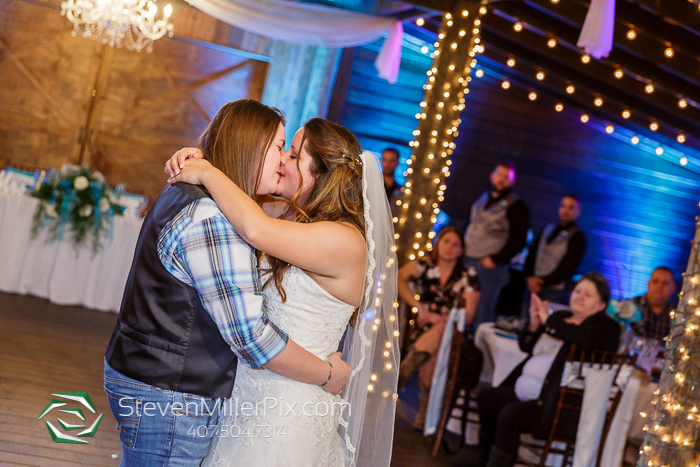 Congratulations Lexi and Brittany, we loved being a part of your wedding day and we cannot wait to see you both again soon! 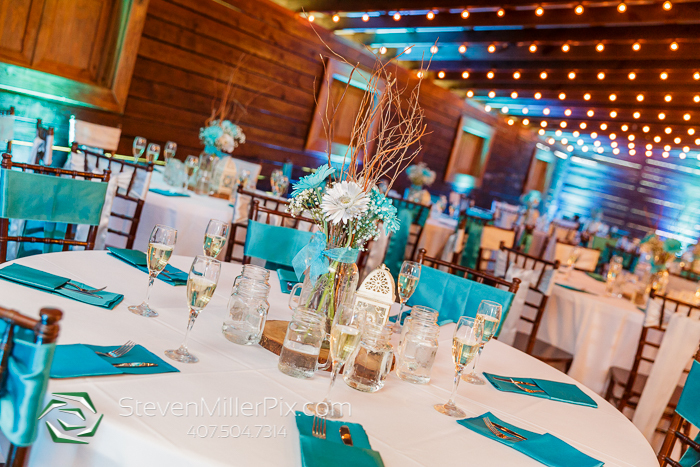 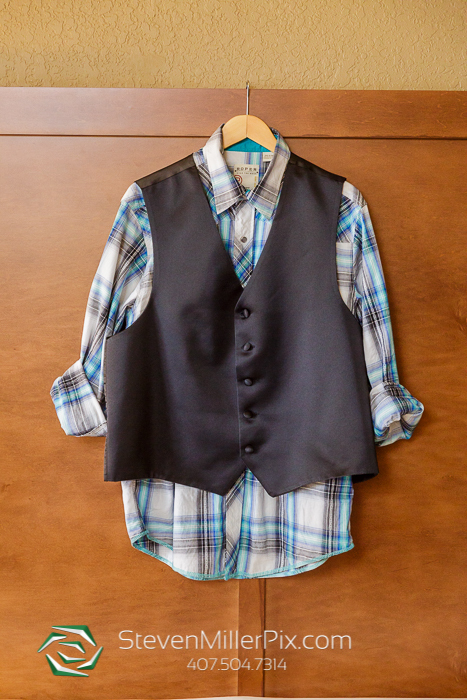 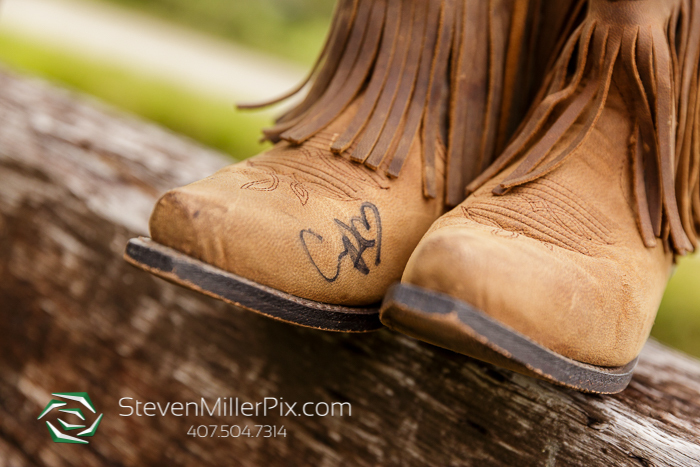 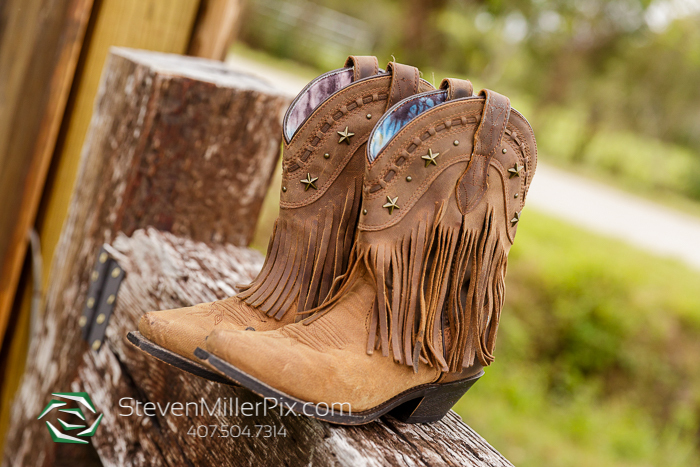 Enjoy this sneak peek!